Your adventure into the professional levels of recreational scuba diving begins with the PADI Divemaster program. Working closely with a PADI Instructor you expand your dive knowledge and hone your skills to the professional level. PADI Divemaster training develops your leadership abilities, qualifying you to supervise dive activities and assist instructors with student divers. 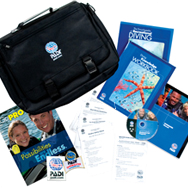 PADI Divemaster is the prerequisite certification for both the PADI Assistant Instructor and PADI Open Water Scuba Instructor. During the PADI Divemaster program, you learn dive leadership skills through both classroom and independent study. You complete water skills and stamina exercises, as well as training exercises that stretch your ability to organise and solve problems as well as help others. How do I start these courses?